People can say what they want about this guy, but Cyclops has endured, fallen, persevered, and remains to be one of Marvel's most recognizable figures. He is an X-man, an original X-Man at that, an X-Factor, a Phoenix Force, and probably an Avenger! Talking about the action figure realm, well Toybiz has made him plastic material since the greater days and during the realm of the Legendary BAFs. So here he is! The X-Factor variant of Cyclops from the Sentinel BAF wave! Yes, the picture is crooked due to the fact I was very excited to get him out of the box and into my hands! Toybiz, got to love the way your toys smell after opening them though! Such nostalgia! I'll admit it right now that I love this suit. Why? It's the first(or one of them) suit I remember ever seeing Cyclops wear. Seeing that one particular trading card way back when I always thought his glasses are cool, then I got to know Marvel and realize that he isn't exactly the one that I should be wishing I should be, but regardless, this figure has its victories in detail. He has a lot of paint work done to him and some good sculpting. Say what you want about the giant boots and gloves, but back then those things are cool! The combination of the white and the blue makes him look like Frozone from Incredibles, but still, it's classic. Cyclops is NOT a flier, so why is it that he has a stand? That's because Toybiz was generous! As one noticed from the picture before the one above, Cyclops has a hole on his back and it's for this stand! He doesn't fly, yes, but it is for dynamic poses! Cyclops is pretty acrobatic to an extent. 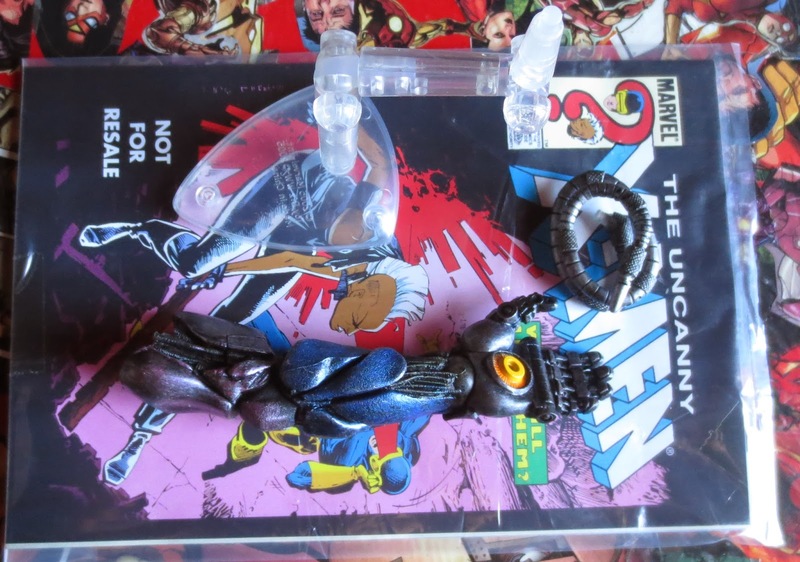 And this is standard: comic book and a Sentinel BAF piece. For articulation, Cyclops falls short here and there. I would say it's the age of the toy and some articulation aren't given back then but that's not the case. He is clearly missing the ab cunch and the ankle pivot that Toybiz gave to some of the toys at this set. Both are pretty critical for some awesome pose, but the one thing they did get right is that he has flexible fingers/hands/arms to get his optic pose; and that's for both hands by the way! Yes, Cyclops does the shoryuken like Ryu in the Capcom games he appeared in. For some reason he called it 'gene splice'. While he may not be adept in martial arts like Ryu is, he does add his optic blast at the end to make it more… adequate. He isn't the highlight of the wave, but at the end of the day he wasn't the worst. If it's the costume design that people have qualms over then this figure won't please; he has the Second generation X-Men variant for this toy, but eve that may be a turn off for some people. Over all, I had fun posing him since he complied with most pose I thought Cyclops would do. All in all, I like this figure and it is my first Cyclops 6 inch! So no complaints here!